The Global Positioning System (GPS) orbit involves a strategic constellation of satellites which provide navigation and time standard services for the entire planet Earth. The GPS orbit is 12 hours long, nearly circular, and approximately 20,000 kilometres in altitude. The American NavStar GPS constellation was engineered such that wherever a person stood on the Earth's surface, at least 4 GPS satellites would be visible (and therefore accessible) at any time. In this way, anyone can find out where (and when) they are on Earth at any time, provided they have a functional GPS receiver with them. 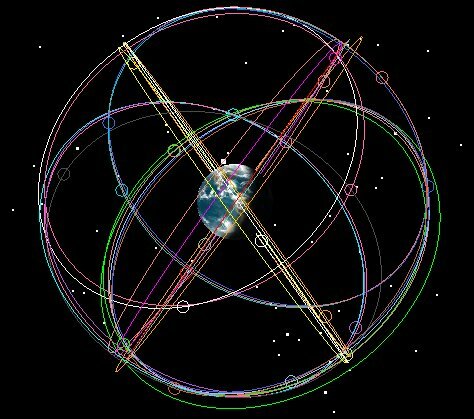 Many references that talk about the GPS constellation depict six well-established orbit planes, each separated by exactly 60 degrees, with four satellites in each plane. The figure below shows the true configuration, which is not as perfect as the other references illustrate. As long as the positions of the satellites in their orbits are known with great accuracy, the orbit inclinations can have a few degrees of leeway. Both the U.S. and Russia have separate versions of the GPS constellation in use, although the U.S. version currently provides greater coverage and accuracy. The figure below illustrates the American NavStar GPS constellation. The European Space Agency (ESA) has begun to launch its own GPS constellation called Giove (Jupiter) that promises to produce more accurate location data than the present-day U.S. NavStar GPS constellation. The Chinese have also announced their intentions of creating their own GPS system. The six U.S. NavStar GPS constellation orbit planes as viewed from above the South American equator. There are four GPS satellites per orbit plane; a total of 24 satellites in all. This image courtesy of Analytical Graphics Inc. (AGI).